On 19 June, Grampian Ringing Group carried out some colour ringing at the Sandwich Tern colony in the Sands of Forvie NNR, Aberdeenshire. The group has a long running study on the species to gather information on survival, recruitment and movements. While rounding up some of the young for ringing, one eagle eyed trainee spotted a pure white chick amongst the regular coloured chicks. This bird was colour ringed, although we were not hugely hopeful of the prospects for a white bird as it would be more noticeable to predators. The photos of the chick were sent to an expert who suggested the bird was probably not an albino, but has the recessive Ino mutation, which results in very poor oxidation of melanin. 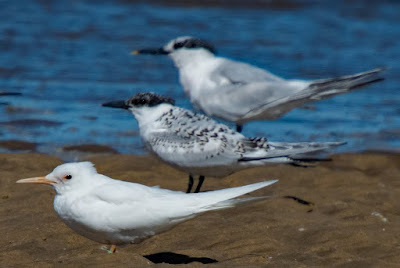 White Sandwich Tern and birds in regular plumage. Photo by John Tymon. Since ringing, we have had several sightings, initially as this distinctive bird migrated down the east coast of Scotland and then over on the west coast of England at Ainsdale beach in Merseyside where it has spent a few weeks. Several people have sent us photographs of it and it has turned into a truly magnificent tern. 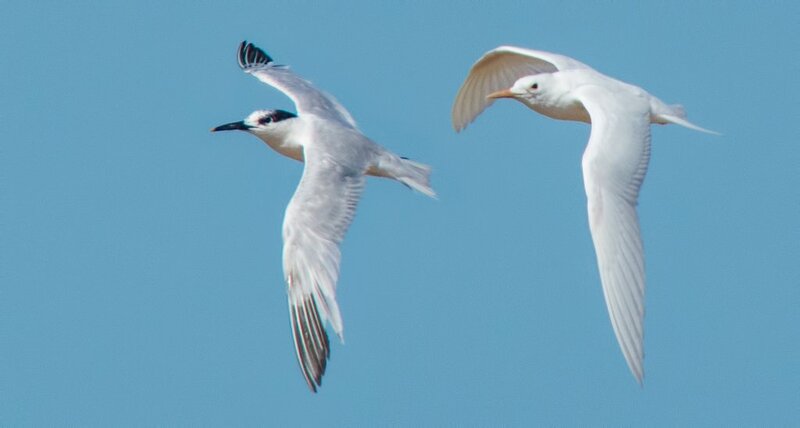 Flying alongside a 'normal' Sandwich Tern. Photo by John Tymon. From this colour ringing project, over the last few years we have found that once birds leave their breeding sites they spend several months on the UK coast (often north of their breeding sites) before heading south to winter predominantly in Africa. Very few Sandwich Terns return to Europe in their second summer, with most only migrating back to Europe in their third or fourth summer. It will be quite a long wait to see if this bird returns to Scotland in a few years time to breed, but if it does I am sure it will be seen. As this project highlights, sightings of colour marked birds have helped increase our knowledge of the movements and behaviours of many species, not just Sandwich Terns. 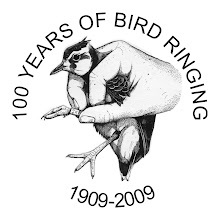 So, if you see a colour marked bird (or find a bird fitted with just a metal ring), please report it at www.ring.ac.